Much has been said about the widely publicized incident that took place last week when community members removed an about-to-be towed car from an NYPD tow truck and urged the driver to flee the scene before making disparaging comments to an NYPD tow truck operator who was just doing his job. 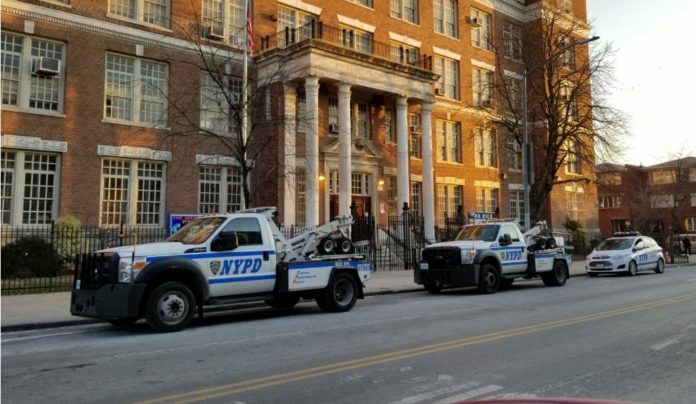 Over the last few days, police tow trucks have been out in force in Boro Park, but the idea that the NYPD is exacting revenge for what happened this past Thursday is a very grave error. We have been in close contact with the NYPD who is very much aware of a massive scam that is taking place in various communities involving bogus inspection stickers and doctored registration decals. There are vehicles on our streets that have these fake stickers and the NYPD is out there looking for them and for their owners, many of whom owe thousands of dollars in fines on their cars. In Boro Park alone, the NYPD is combing the streets looking for many of these vehicles and their owners, whose identities are known to them. An SUV that was towed today in Boro Park, whose picture has been circulating on social media and elsewhere, had no registration sticker in the window, its license plate revealing $3,025 in accrued violations. Another person who was arrested after police towed his car had accumulated over $16,000 in fines. The NYPD and its tow trucks have their eyes on Boro Park, but they are not retaliating for last week’s disaster. They are here because of problems of our own making – people in our community who are deliberately and flagrantly violating the law, producing fake inspection stickers on high tech machinery, and creating counterfeit registration stickers. And once police are already out with their tow trucks because of this scam, they are coming down hard on illegally parked cars, which instead of just being issued summonses, are also being towed. Those fraudsters who think they are pulling a quick one with those fake decals? They are the the primary reason for the rash of towing in the last few days and not anyone else. Cars parked illegally, in front of or near fire hydrants, are another cause of the recent crackdown. By law, a 15 foot clearance is required on either side of a hydrant and parking any closer than that to a pump, on either side, is illegal. There is no question that parking is difficult in our area, but the law exists to save lives, not to create emergency spots for private vehicles. It is not lost on the NYPD that people have been parking in front of hydrants overnight, assuming that no one will be writing tickets at that time of the day, and they have every intention of issuing summonses and towing any car they find 24/7 that is parked less than 15 feet from a fire hydrant. These practices of bending or breaking the law to suit our own purposes create an enormous chilul Hashem and they need to stop immediately. If you are in possession of any doctored inspection or registration stickers, we strongly suggest that you clean up your act now, before the NYPD comes after you and, make no mistake about it, they know who you are. Get your car legally inspected and registered. Pay any outstanding fines you owe. And for those responsible for these unethical and immoral schemes, we need you to wake up and realize that what you are doing is unacceptable and the entire community is paying the price for your unmitigated greed and incredible foolishness. Finally, know that if you park in front of, or too close to a fire hydrant, your car may not be there when you come back and that not only may you be facing a hefty fine, you could also be responsible for loss of life in case of a fire. We are here in this world to be a light unto the nations. It’s time we started acting that way. The Boro Park community @misaskim @cb12 @BPShomrim & other community leaders would like to apologize to the @NYPDnews @NYPDTransport tow truck driver for the incident that took place on Thursday. We thank you for the job that you do everyday & hope we can someday make up for it. Very well written! Doctored registration inspection and registration stickers? Is that the new scam now? Do they realize that they are forging an official document? It so happens to be that Misaskim and Mr. Perlstein openly criticized the NYPD on many occasions in the past year, including an instance in which an elderly Jew was roughed up for allegedly talking on his cell while driving. It seems like the askanim know when to call out the NYPD and also understand when to plead for normalcy with the community. That is why they are askanim with the community at its interest. I don’t know the authors of this open letter, and I don’t know the sources of their statements about the fraud that, they say, is prompting the NYPD to be aggressively towing cars in Boro Park. Nevertheless, and subject to the foregoing, I thank YWN for publishing this letter. I received a false parking ticket once – 44 years ago – and I am still mad about it. But I am courteous to the traffic enforcement officers for doing their thankless jobs, which make the city livable for all of us. I have gotten my share of parking tickets, and I pay them promptly, even if I had to park illegally because it was inconvenient for me to do otherwise. If the arrogant few – frum and otherwise – who try to cheat the system and their fellow citizens and insist on parking where they please when they please, the city as a whole will suffer. Kol hakovod to the Shomrim, MIsaskim, et. al for speaking out clearly against the pervasive violations of NYC traffic and parking rules and the sense of entitlement to violate those rules among a small segment of the frum Tzibur in certain neighborhoods. Their arrogance is more than just an inconvenience to the 95 percent of the tzibur who follow the rules….it sometimes results in real sakanah to the community. Its more than an arcane issue o dina d’malchusa. Its an outrage that needs to stop and these police enforcement actions will hopefully send a message that such behavior will no longer be tolerated. I agree, however in a city where parking is so hard to come by for the citizens who are paying their brains out in taxes, more should be done to provide parking. Requiring 20 feet instead of 30 feet for a pump for example, will not preclude the fire fighters from being able to hook up a hose. What about providing municipal lots – for no cost, like many other cities do. Make no mistake about it, the lack of adequate parking in the city is deliberate, because it is a cash cow for the city so that comrade deblasio could give free health care and retirement to the lo yootzlachs of the city while the working class is required to foot the bill. 1) In both cases cited above, the NYPD did their job. 2) In one case, we, Yidden, unfortunately, did not. Fake registrations? Thousands of dollars in unpaid fines? 3) Perhaps if you would see yourself as not “just a Jew” but rather one important member of the Am Ha’Nivchar, you would not contemplate, let alone post, such beliefs as you have posted above. Nice to know this is what theyre sooooo busy with when I call them about a blocked driveway and never show up. Or when there’s an accident and they don’t show up for at least 6 hours . i really do appreciate your involvment in issues concerning our communities. I would like you to get involved by another selfish act from hundreds of our community homeowners. Who gives some one the RIGHT to create an illegal driveway and post a NO PARKING sign DO NOT BLOCK DRIVEWAY. is this FAIR to take away a parking spot from your next door neighbor so you always have a reserved spot when you come home? I dont believe in any yid massering another yid , but if that car owner parks on his so called driveway they call 911 to ticket the car and then have him towed. Is this allowed ? and while at it its time for the Community Board to solve the School Bus Parking problem and find a major lot for all Yeshivas to Park their buses and free up the local streets for its citizens, and especially if the Yeshiva owns a Chasene hall they should cnsider the guest to be able to Park. Just because you already are out towing fraudsters etc, does not morally justify towing away ones vehicle. Let them provide an adequate solution for parking as well. I agree with the commenters saying the city needs to provide parking lots and legalize parking up to 10 ft either side from the pump as opposed to the current 15′. Perhaps askonim and local politicians can work on those issues. On the other hand, and regardless, Yidden still need to act like Yidden. It’s terrible when frum Jews scream at agents, are chutzpadig to the police, post ridiculous videos on YouTube, etc…and of course, are involved in scams producing illegal documents ( of which a tiny, tiny minority of crooks in our community are guilty of and this does not reflect who the community is as a whole). This immature behavior is unbecoming for frum Jews. Besides for the fact that many Yidden need to be reminded that even though they are the majority in frum areas, we still don’t own the streets. People shouldn’t live in a self-contained bubble and think they are immune to the consequences of their actions. Why does the hydrant allowance get bigger and bigger?? How much space is needed to hook up a hose already?? Agree with GAON. A $165 ticket for parking too close to a hydrant is enough. The driver understands the risk and accepts it. Being towed should not be a legitimate risk, despite NYC being declared a tow away zone. Do me a favor. Reb Yossel You took the words out of my mouth. I once proposed a plan to plant a tree in front of these driveways. I would also like to add the many mechanics, car services, supermarkets, who keep their vans or cars on the street over night to hog spots for their workers. The scams are criminal, and the instigators and peddlers of these counterfeit documents should face criminal charges. Customers should face fines, and if their cars are in violation of city parking laws and/or owe substantive fines, towing may be completely appropriate. However, these criminal issues don’t justify physical abuse. BPers may be concerned about being targeted, particularly if other parts of NYC which have greater or equal instances are not held accountable. Nonetheless, we should exemplify good citizenship, and make a K”H. BP does need more parking facilities, and less competition of spaces from buses, etc. I would advocate for local tram services up and down some avenues, and some streets. Electric scooters may start showing up, its now a national phenomena, with all their issues. Walking is healthy and convenient for local jaunts, and perhaps someone will produce an inexpensive collapsible shopping cart for shoppers. Like the airports, would people mind parking more remotely, if trams brought them into bp and back? Let’s go leaders and activists, get your problem solving skills on the issues! I fully agree with the letter, and saddened to learn of these scams. The police have always had a limited number of tow trucks in Brooklyn towing illegally parked cars. If a car can be ticketed, it can be towed. The tow truck drivers can issue the ticket and tow. Usually this is only done for blocking hydrants, crosswalks and bus stops, and there is never a shortage of violators to tow. Community Board 12 should work with the Department of Buildings, the Department of Transportation and the NYPD to end the illegal curb cuts in Boro Park giving everyone a fair shot at legal on street parking. Creating an illegal driveway is GEZEILAH. Ask any DAYAN that knows Chosen Mishpat. Everyone has equal right to a parking spot unless otherwise designated by city for what ever reason. By creating the illegal cut in the curb does not make it your private parking spot. DINA D’MSLCHUSA. In addition they park their cars in a way that they block the sidewalk and make it difficult for people. The city should crack down on all the illegal driveways and also tow vehicles parked blocking the sidewalk. Driving is another sore subject in Boro Park. Passing red lights, not yielding to pedestrians, not obeying the right of way law, and the list goes on and on. Every rule in the book is disregard. Uber and the likes are some of the biggest culprits of creating the congestion in the area. Absolutely don’t care about anything. By respecting others you will be respected. WHATS WITH THE “SAFETY” 15 FEET SAFETY SAFETY SAFETY THINK AGAIN!!!!! Kudos to the writers of this letter. I’m so impressed with their courage to tell it like it is and not be afraid of what some arrogant members of our community will say or do. It’s about time that everyone in our community develop the maturity and sophistication to know that the law is the law and it applies to everyone. Stop being an “Ibir chochom” , thinking that you are above the law and that only naive people actually obey the law. I hope that these people who are falsifying registration and inspection stickers, not paying their tickets and think they can fool the system have learned their lesson. I would like to thank Kalmen Yeger Promised And Delivered! We now have valet parking service In our neighborhood, Just park you vehicle where ever you want they will provide you with a number to call once you need it back, it’s currently a pilot program and we will see how things work out, Thanks for your patients. That said, regardless of the messenger/s the message should resonate loud and clear: Chillul Hashem is the worst! That said…, after long analysis I for one think the cause is hopeless. After a Rebbe gets indicted, convicted, and serves time, he comes out and continues in his revered position as if nothing happened. And, (although you don’t start a sentence with and) NOBODY says a word. No matter what the excuse…what does it teach all of the next generation regarding DINA D’MALCHUSA/CHILLUL HASHEM. At least have the decency and responsibility to lay low. To repeat, it’s a loss cause. Whoever truly believes that there’s ‘no revenge’ going on, I got a bridge to sell you (not the Tappan Zee). I live RIGHT out of BP and witness on a nightly occurrence cars parking near – 4-5 feet – an hydrant and are NEVER ticketed. See for yourselves. Thousands of dollars in unpaid fines?!?! that could just be a few alternate side parking with like five months interest. I wish I could get such high interest on my investments/ bank accounts! as an aside, did anyone realize that if you drive a fifteen passenger van over the Verazano bridge you get charged $60 now as if you were a truck?! insanity! the port authority is so bloated that they have no business charging anybody! they spent over $3 billion on the world trade center, when they didn’t need to spend a penny! the guy that had leased most of the twin towers before 9/11 wanted to undertake the construction himself. The greedy port authority took it away from him and built it themselves! now they say that they will never recover the full amount they spent, but the income it brings is good for backing up their bonds. insane! these people should be tarred and feathered! Its time the Rabbis let their congregants know that anyone parking illegally just so they can catch a minyon (tovel v’Sheretz b’yodu) is not welcomed into the shul. On a daily basis, hydrants, driveways are blocked by those rushing to minyon. Time to add this notice to the posters that prohibit smartphones in shul. Better they daven b’yechidus and not put the tzibur in danger. The fraud described in this post is disgusting and I am glad that the police are cracking down. HOWEVER, this is a situation of selective enforcement. Does anyone think that this fraud is particular to frum neighborhoods? Does anyone think that it does not exist on a much larger scale in other neighborhoods? Have there been similar crackdowns in, for instance, sections of Washington Heights, where illegal parking is the rule? Have there been crackdowns in any ethnic enclave in NYC (other than those of frum yidden), which by their tightly-knit nature and outsider mentality — whether it’s Asian, Latino, Caribbean, or African American — are generally more prone to these kinds of scams? till then i will listen to the tzadik Yanky Meyer!!!! THIS IS ALL BALONEY!! i met someone yesterday who doesn’t have one single ticket, she parked not knowing she couldn’t park there, the sign was far away and she was towed! With not even one ticket unpaid in her history. they are on a rampage and its disgusting! Go to Bed/Sty and try doing it there! Mordche 1: These 4 individuals actually DO speak for a large percentage of the community as evidenced by the widespread support for their views just on this thread alone. They did NOT claim to speak on behalf of the tzibur but framed their let TO the tzibur in a clear and forceful way expressing their OWN OPINIONS as to what would be the appropriate behavior and actions. You are welcome to disagree and draft your own letter to the tzibur and offer it for publication here or other media outlets. Shlomo, your comment reminds me of the average 5 year old. When caught by mother doing something wrong , he justifies bad behavior by crying ” but my sister did it too!!”. We can’t justify bad behavior by pointing at others. For all you know, there may have been crackdowns elsewhere. Just because others eat treif, are michalel Shabbos, or steal, does that mean we can too? To just asking who made them spokesman? These askanim are the ones who the community turns to when help is needed with government officials. Take Yanky Meyer, for example, Misaskim was in the news twice this week Motzai shabbos helping a fire victim find his belongings and yesterday helping find lost teffilin in the garbage. In both cases it was it was Mr. Meyrs connections with FDNY and sanitation officials that made it possible. Now back to our story. My business takes me to different neighborhoods of NYC. To those that think Boro Park is being targeted, you are wrong Boro park is gold compared to what I see in other places. TO those that make it sound like Boro Parkers are the worst traffic offenders It must be you never went out of Boro Park You have traffic violators in non jewish neighborhoods also Boro park is for sure not the worst. As far as the traffic agents doing their job I live on a commercial block in Brooklyn near a supermarket. There is a long no parking trucks only until 6pm zone. I’ve seen tickets being given at 5:58. I’ve seen cars and commercial vans who were double parked get tickets while they were loading their cars or vans. There are some agents who are nicer than others but too many of them are like vultures waiting to pounce on their prey. I know the good-doers out there would say park legally. Maybe you have an illegal driveway or you shop in a mall. You don’t know the frustration of driving around and around looking for a legal parking space. A parking ticket in a no standing zone is $115 hats almost a days pay for many people. Adding on a tow plus a days work trying to get back your car is barbaric.